PATTANI, Thailand (Reuters) - Several bombs have gone off in Thailand's insurgency-plagued south killing one person and wounding dozens in a new wave of violence, the military said on Thursday. The blasts were in Pattani, one of three Muslim-majority provinces in largely Buddhist Thailand, near the Malaysian border, on Wednesday and Thursday. Resistance to central government rule has existed for decades in the area but violence picked up significantly in 2004. More than 6,500 people, including Buddhist monks, teachers, troops and separatist insurgents have been killed since then. At least 10 bombs went off in Pattani's Yaring district, including two at bank cash dispensing machines, wounding 11 policemen. A civilian man was killed after being caught in a blast near a hair-dressing shop, a military spokesman said. "The people causing the trouble want to show they are still active," said Colonel Yuthanam Phetmuang, deputy spokesman for the military's Internal Security Operations Command. No group claimed responsibility for the attacks which authorities have blamed broadly on insurgent groups. In January, the military and conflict analysts said violence in the south had fallen to its lowest level in more than a decade because of stepped up security efforts. 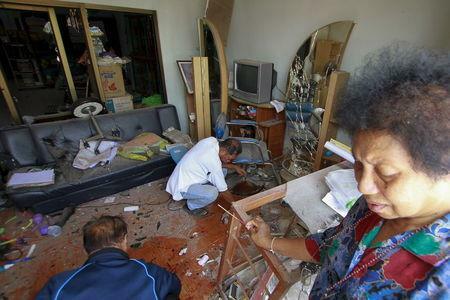 The explosions followed multiple gun and bomb attacks this month in neighboring Narithawat province. People in the south complain of years of neglect by Bangkok. The failure of successive governments to quell the violence has fanned distrust of the state in the region, which was an independent Malay Muslim sultanate a century ago before being annexed by Thailand. Shortly after taking power in a 2014 coup, the military vowed to bring peace to the south within a year.